Charcot foot is a condition causing weakening of the bones in the foot that can occur in people who have significant nerve damage (neuropathy). The bones are weakened enough to fracture, and with continued walking the foot eventually changes shape. As the disorder progresses, the joints collapse and the foot takes on an abnormal shape, such as a rocker-bottom appearance. Charcot foot is a very serious condition that can lead to severe deformity, disability, and even amputation. Because of its seriousness, it is important that patients with diabetesâ€”a disease often associated with neuropathyâ€”take preventive measures and seek immediate care if signs or symptoms appear. 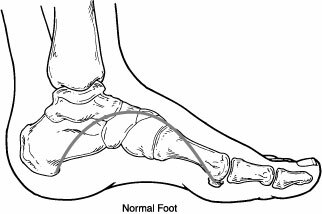 Charcot foot develops as a result of neuropathy, which decreases sensation and the ability to feel temperature, pain, or trauma. Because of diminished sensation, the patient may continue to walkâ€”making the injury worse. People with neuropathy (especially those who have had it for a long time) are at risk for developing Charcot foot. In addition, neuropathic patients with a tight Achilles tendon have been shown to have a tendency to develop Charcot foot. Early diagnosis of Charcot foot is extremely important for successful treatment. To arrive at a diagnosis, the surgeon will examine the foot and ankle and ask about events that may have occurred prior to the symptoms. X-rays and other imaging studies and tests may be ordered. Once treatment begins, x-rays are taken periodically to aid in evaluating the status of the condition. 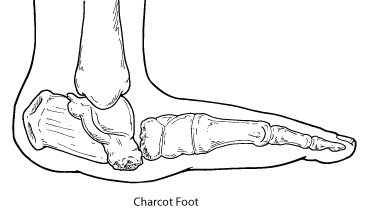 It is extremely important to follow the surgeonâ€™s treatment plan for Charcot foot. Failure to do so can lead to the loss of a toe, foot, leg, or life. Immobilization. Because the foot and ankle are so fragile during the early stage of Charcot, they must be protected so the weakened bones can repair themselves. Complete non-weightbearing is necessary to keep the foot from further collapsing. The patient will not be able to walk on the affected foot until the surgeon determines it is safe to do so. During this period, the patient may be fitted with a cast, removable boot, or brace, and may be required to use crutches or a wheelchair. It may take the bones several months to heal, although it can take considerably longer in some patients. Custom shoes and bracing. Shoes with special inserts may be needed after the bones have healed to enable the patient to return to daily activitiesâ€”as well as help prevent recurrence of Charcot foot, development of ulcers, and possibly amputation. In cases with significant deformity, bracing is also required. Activity modification. A modification in activity level may be needed to avoid repetitive trauma to both feet. A patient with Charcot in one foot is more likely to develop it in the other foot, so measures must be taken to protect both feet. In some cases, the Charcot deformity may become severe enough that surgery is necessary. The foot and ankle surgeon will determine the proper timing as well as the appropriate procedure for the individual case. Keeping blood sugar levels under control can help reduce the progression of nerve damage in the feet. Get regular check-ups from a foot and ankle surgeon. Check both feet every dayâ€”and see a surgeon immediately if you notice signs of Charcot foot. Be careful to avoid injury, such as bumping the foot or overdoing an exercise program. Follow the surgeonâ€™s instructions for long-term treatment to prevent recurrences, ulcers, and amputation.